Panama Papers: Here’s who has been caught in the fallout of the Mossack Fonseca leak The unprecedented leak of more than 11 million documents from Panamanian law firm Mossack Fonseca has revealed some of the hidden financial dealings of the world’s rich and powerful. in a rare public comment about safety concerns, China’s own State Council Research Office three years ago warned that the development of the country’s power plants may be accelerating too quickly. China Regulators ‘Overwhelmed’ as Reactors Built at Pace, Bloomberg Tara Patel, Benjamin Haas , June 20, 2014June 19 (Bloomberg) — China is moving quickly to become the first country to operate the world’s most powerful atomic reactor even as France’s nuclear regulator says communication and cooperation on safety measures with its Chinese counterparts are lacking. In the coastal city of Taishan, 100 miles (160 kilometers) from the financial hub of Hong Kong, Chinese builders are entering the final construction stages for two state-of-the-art European Pressurized Reactors. Each will produce about twice as much electricity as the average reactor worldwide. Unthinkable as it may seem, Churchill’s plan literally won the hearts and minds of US policy makers and military officials. the Kennedy administration introduced significant changes to the plan, insisting that the US military should avoid targeting Soviet cities and had to focus on the rival’s nuclear forces alone. 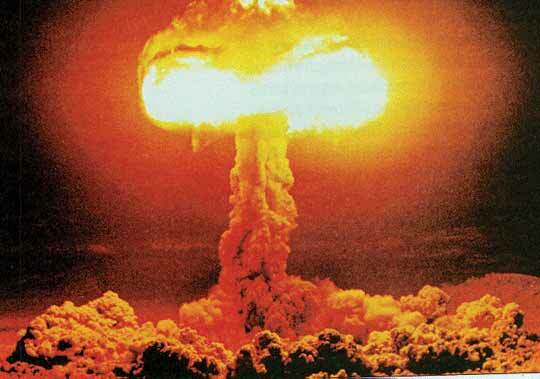 Post WW2 World Order: US Planned to Wipe USSR Out by Massive Nuclear Strike, Sputnik News. Ekaterina Blinova. 15 Aug 15, Was the US deterrence military doctrine aimed against the Soviet Union during the Cold War era really “defensive” and who actually started the nuclear arms race paranoia? Mururoa nuclear testing witness spent years in pain, group seeks answers, Mururoa Veterans, SIMON EDWARDS, August 17 2015 There’s no doubt in Christine Hapuku’s mind that her late brother’s health problems stemmed from his exposure to fallout from the French nuclear testing at Mururoa Atoll. At the weekend Christine and Alec Gage’s wider family unveiled his headstone at Wainuiomata’s Memorial Garden, a year ago almost to the day since his death. ……..Gage was a sailor on HMNZS Otago, which with the frigate Canterbury sailed to Mururoa in 1973 to protest the nuclear testing by France. He and his brother Bob, who was also on board, would talk about standing on the ship’s deck wearing metal discs around their necks that were to measure how much radiation they absorbed. The pair said the atmospheric testing fall-out was like fine rain, Hapuku said. “Even the French acknowledged the bombs were a lot stronger than they were meant to be. …….Christine Hapuku said medical researchers used to talk to Alec when he was in hospital but they never heard anything more. She is hoping further research being pursued by the Mururoa veterans’ group might give the family some closure. The Mururoa Nuclear Veterans Group is searching for all those who sailed to Mururoa Atoll in 1973 aboard HMNZS Canterbury and HMNZS Otago. The group, formed in 2013 and registered as a Legal Society, monitors the medical conditions that have affected not only the personnel aboard the two frigates but also their children and grandchildren. The group’s president, Wayne O’Donnell, said because there was no full list of the veterans who served at Mururoa they need the public’s help. The group established a trust fund to enable the medical testing of the veterans’ children and grandchildren. “It is hoped the results will establish the truth of the genetic transfer of illnesses related to the nuclear exposure encountered by the crews,” O’Donnell says. Tianjin explosions ignite barrage of questions, The Age, Philip Wen China correspondent for Fairfax Media, August 14, 2015 Tianjin: As fatalities continue to mount, so too have questions around the cause, response and potential health effects of the terrifying explosions at a toxic chemicals warehouse that tore through the port city of Tianjin, China, on Wednesday night. Chinese authorities have dispatched more than 200 military nuclear and biochemical materials specialists to the site of the blast, as well as a team from the International Atomic Energy Agency’s Beijing environmental emergency response centre. But some 36 hours after the explosions, municipal and environmental officials said they were still unable to determine the specific substances held in the warehouse which likely triggered the blast which killed dozens, injured hundreds, and ignited a fireball so large it was captured by orbiting satellites. The owner of the warehouse, Ruihai International Logistics, is a firm which specialises in handling hazardous cargo, state news agency Xinhua said. It is licensed to handle dangerous and toxic chemicals including sodium cyanide, compressed natural gas, phosphoric acid, potassium nitrate and butanone – an explosive industrial solvent. Though a pungent smell and visible smog hung in the vicinity of the blast, officials said 17 emergency air monitoring stations indicated air quality in the city remained within a normal range, aided by easterly winds which blew toxic plumes from the fires out to sea. Readings of cyanide and chemical oxygen demand – a measure of water quality – some three to eight times normal levels were detected near two underground discharge pipes, though officials said the pipes had been sealed off and posed no danger to health or the environment of the surrounding area. Xinhua said 1000 firefighters and more than 140 fire trucks were struggling to contain the blaze in a warehouse which stored “dangerous goods”.